its been a wile since I've played around with Mission editor, I was wondering how do I set up landing where the viper or Raptor lands or touch down in the Landing bay? Have an event set to trigger the mission end when the distance between the player ship and the fighterbay subsystem is about a few hundred meters, longer depending on how big the fighterbay is. Would you like me to set up an example event and take a screenshot for you? Sorry that I'm not doing it right away but I'm a tad busy. PVD Hope: Keep in mind this is about Diaspora style deck landings, not FSO style proximity to fighterbay landings. The Diaspora ones are quite a bit more complicated, if memory serves. Well, you can DL it, play it, say the devs that you liked it and then look at the mission files how they did it. Here's the event from Mission 2 of Diaspora. 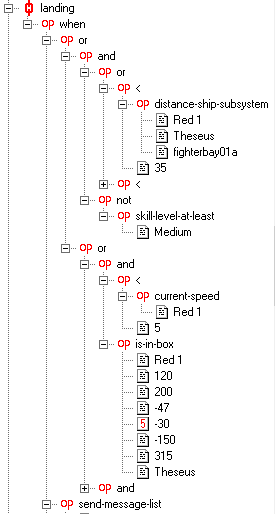 I've closed the parts that are identical except for referring to the other fighterbay. I notice that the topic also includes launches. I'm going to see about bumping the release in Knossos and adding our launch script to Diaspora, there's absolutely no good reason for someone to have to put up with the old way of doing launches. how do I add this for the player ship? Ohey, I didn't realize that the Diaspora method was different. That's interesting. 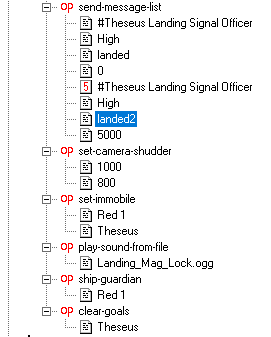 Red 1 was the player ship in that example. I also would like to set up a Raptor launch from the landing bay do I need to set up an event for that as well? where can I find the campaign mission files? can I use the Mission editor to open the files? To look inside the VP files, you need VPView. When you open up a VP file in there, you should see a missions folder with several fs2 files inside. Each of those is a single mission file, which you can open in FRED. FRED is the mission editor? I down loaded the VP program I still cant open any of the mission files. You need to extract the mission files and save them. Then FRED can open them. I've attached the FRED that I been working on can you take look at it, apparently I'm doing something wrong. basically I want my raptor to land in the landing bay in this mission.